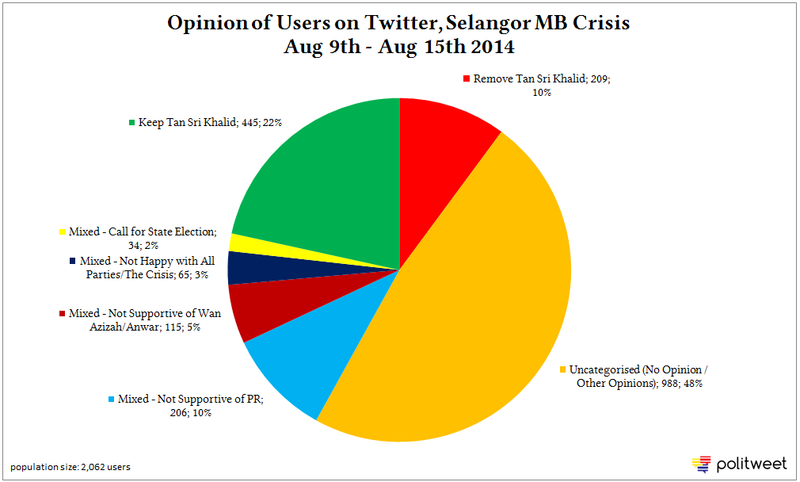 Mixed opinions are from users who are not clearly supporting Tan Sri Khalid staying on or being removed. Some of the reasons given by the Mixed opinion groups are the same as the ‘Keep Tan Sri Khalid’ and ‘Remove Tan Sri Khalid’ groups, the difference being that the Mixed opinion groups had no clear stand. Uncategorised opinions are from users who have no clear opinion that matched the criteria of the other stated categories. A previous version of this report ran on our Facebook Page with the label ‘No Opinion’ instead of Uncategorised (No Opinion / Other Opinions). This was corrected to avoid confusion. What follows are the prominent reasons users gave for supporting the stated opinion. c) she is inexperienced or ‘not good enough’. As a result of this analysis we can say that the public perceive Tan Sri Khalid as a well-respected people’s representative and not a political party representative. The reasons given by PKR for sacking him were not explained well or accepted. As a result Tan Sri Khalid’s sacking was seen as unfair and unreasonable. For example, signing the MoU with the Federal Government on the Langat 2 Project was one of the reasons cited by PKR for his dismissal. However users that mentioned Langat 2 viewed it as a good move to end the water supply problem. The water supply issue was also seen as more important than a change in Menteri Besar. Pakatan Rakyat’s (primarily PKR’s) actions during this whole crisis were widely criticised, even by users who accepted Tan Sri Khalid’s dismissal. PR was seen as taking action against Tan Sri Khalid in their own interest and not the people’s interest. a) PR publicly speaking about past problems with Tan Sri Khalid served to make more users doubt PR’s leadership. This pushed users to support Tan Sri Khalid further, though some became fed up with politics. b) When Tan Sri Khalid dismissed the State Excos following their refusal to meet him, users responded with praise for Tan Sri Khalid. They saw it as a bold move and decisive leadership. c) When the State Excos returned to work the next day, PR earned criticism. d) PAS was both praised and criticised by different groups of users for supporting Tan Sri Khalid.